Laminitis Symptoms and the signs to look out for … Laminitis most commonly affects the front feet but can also affect only one or all of the horse’s feet. 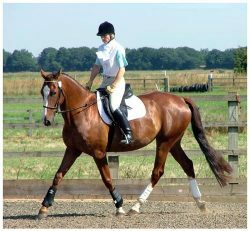 Horse’s affected by laminitis stand badly in a characteristic way in order to take weight off their toes. The forelegs are stretched forward to put most of the weight on the heels. The hind legs are also moved forward and tucked under the horses body. 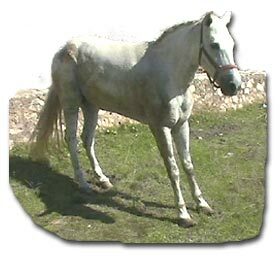 Mild or chronic cases of laminitis may just show occasional lameness on rough hard ground. A little stiffness rather than obvious lameness or a little sensitivity to hoof testers. There may also be evidence of damage in the past, in the form of laminitic rings on the horse’s hooves. 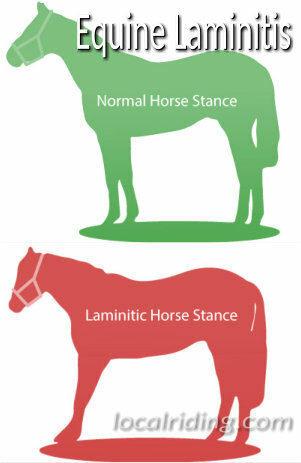 In severe laminitic cases, horses may constantly try to shift weight from one foot to another and also resort to lying down on one side so that no weight is on their feet. Laminitic horses often need to be forced to move. Walking causes them severe pain. When they do walk they take short hesitant steps which become worse when they try to turn. In chronic laminitic cases the white line between the hoof wall and the sole may become weaker and make the development of seedy toe and infection more likely. The sole of the laminitic horse hoof may also become flat and nearer the ground than in normal horses. If you or your vet try to raise the foot of a laminitic horse, (so that they stand on three legs), they may collapse with the pain. In such cases the pulse and breathing rate of a horse are likely to be increased, the temperature may be increased and they may be trembling and anxious. Many people looking for laminitis symptoms make much of excess heat that may be present in the foot and a stronger than normal pulse at the level of the fetlock. These are useful signs but can be unreliable. As well as these laminitis signs there may well be pain just in front of the frog when hoof testers are applied. When there has been a rotation of the pedal bone you may be able to detect a slight depression in front of the coronary band. As the pedal bone rotates it also reduces blood supply to the coronary band where horn is made, so that the rate of production of new horn is slowed. This slowing produces laminitic rings in the hoof which are wider at the heel than at the toe. As this process progresses the hoof develops high heels and a long toe and the hoof wall becomes concave at the front. Find out aricept online coupons more about revision breast augmentation now..